Star Wars: The Old Republic is an MMORPG that I have been playing on and off for a year and a half now. With the first year of college done I have been spending a lot more time in the SWTOR Galaxy plotting the demise of the Republic with my guild buddies who play primarily with the Empire faction. I’ve already made multiple posts about why I think Star Wars: The Old Republic is such a great game but today I’d like to show off the three characters I have the most fun playing in the game. First up is my Bounty Hunter who I chose to go with the Mercenary advanced class. She is my PvP healer who keeps allies alive and can be found on the front-lines of many warzones. I like my mercenary because of excellent survivability and the feeling that I am really contributing to the battle by keeping allies up. Paired with another healer or a tank providing protection and the chance of grabbing victory for the empire is vastly increased. The Sith Inquistor class should have been my main class when I started playing SWTOR in late 2011 but I fell in love with the Imperial Agent story and rolled a sniper instead. “Jah” as I like to call her is my evil Sith Sorcerer who gets great pleasure from killing things with force lightning. I really enjoy playing this toon because of the particle effects and utility it provides plus shooting lighting from your fingertips never gets old. For RP reasons she almost never uses a lightsaber and sports a variety of ornamental vibroswords instead. My main character is an Imperial Agent Sniper with the code name “Infidel”. The class story plus abilities focusing on tech, gadgets, probes, range and the best looking ship in the galaxy makes my geeky heart flutter with each snipe, ambush and orbital strike. This toon is primarily for endgame operations/raiding and PvE and easily has the highest body count of all my other characters combined. When not recovering ancient technology for the Empire or keeping Hutts in check she can be found zipping around the galaxy in her X-70B Phantom. 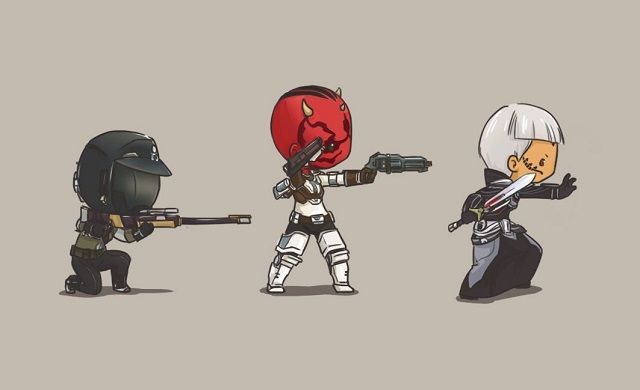 A few days ago I was surfing the SWTOR subreddit when I came upon a drawing done by a redittor that showed chibi versions of SWTOR characters. Reluctantly I asked if I could get something similar done for my toons and surprisingly I was successful! Ladies and gentlemen I present to you Infidel, Rasta and Jah – chibified! This will definitely be printed and hung on the wall of my mancave in the future. Thank you Katnapp, be sure to visit her Tumblr blog at katnappt.tumblr.com. As usual if you are reading this and decide to try Star Wars: The Old Republic which is now free to play visit the website for more information and join my on the server called “The Ebon Hawk”, I play mostly the Empire side! I do not like Star Wars but good game though!